With a basic understanding of your chainsaw and how it is intended to be used, you can reduce or eliminate the element of surprise from kickback or other unexpected reactions. You will also be able to maximize the life and utility of the saw and its cutting attachments. 1. Before using any chainsaw, thoroughly read the manufacturer's operating and safety instructions. 2. Do not operate a chainsaw when you are fatigued, if you have been drinking alcoholic beverages, or if you have been taking prescription medication or non-prescription drugs. 3. Use safety footwear, snug-fitting clothing, protective gloves, and eye, hearing, and head protection. 4. When cutting, hold the saw firmly with both hands, with thumbs and fingers encircling both chain saw handles. Grip the saw with the right hand on the rear (throttle) handle and the left hand on the front handle, even if you are left handed. A firm grip will help you maintain control of the saw in the event of a kickback or other unexpected reaction. Keep the chainsaw handles dry, clean and free of oil or fuel mixture to avoid slipping and to aid in control of the saw. 5. Chainsaws are designed to be run at full speed. Maintain a full throttle setting while cutting to maximize your productivity and to reduce fatigue for safer operation. 6. Cut while standing slightly to the side, out of the plane of the cutting chain and guide bar to reduce the risk of injury in the event you lose control of the saw. 7. Carry the chain saw with the engine stopped, the guide bar and cutting chain to the rear, and the muffler away from your body. When transporting your chainsaw, always use the appropriate guide bar scabbard. 8. Do not overreach or cut above shoulder height. It is very difficult to control the saw in awkward positions. 9. Do not operate a chainsaw in a tree or from a ladder unless you have been specifically trained and are equipped to do so. There is a risk that you can lose your balance because of cutting forces on the saw or movement of material being cut. 10. Some cutting tasks require special training and skills. Remember, there is no substitute for good judgment. If you are in doubt, contact a professional. 11. To avoid the risk of kickback, make sure that the area in which you are cutting is free from obstructions. 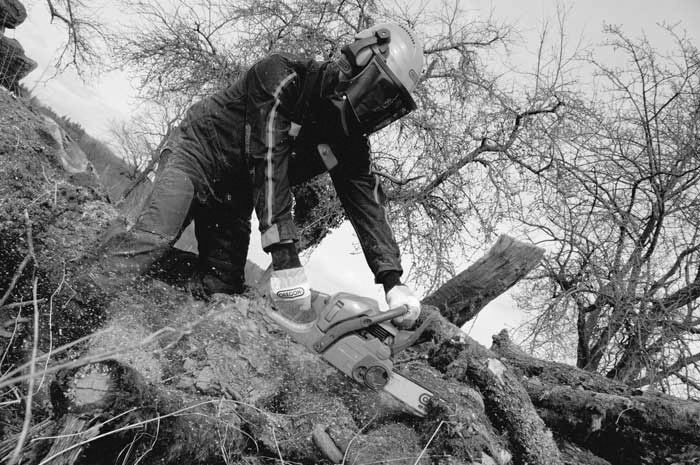 Do not let the nose of the guide bar contact a log, branch or any other obstruction while you are operating the saw. Do not cut near chain link fences, wire fences, or in areas where there is loose or scrap wire. 12. Do not start cutting trees until you have a clear work area, secure footing, and a planned retreat path from the falling tree. 13. Be careful in the event the wood closes in and pinches the saw. The 'push' force which is exerted when the top chain is pinched can add unexpectedly to any 'pull' force you may use when attempting to pull the saw free. You may pull the moving chain into yourself. 14. Use extreme caution with cutting small-size brush and saplings because slender material may catch the cutting chain and be whipped toward you or pull you off balance. 15. When cutting a limb or sapling that is under tension (called a springpole), be alert for springback so that you will not be struck by the limb or chainsaw when the tension in the limb is released. 16. Do not allow other persons to be near the chainsaw when starting the saw or cutting with it. Keep by-standers and animals out of the work area. 17. Keep all parts of your body away from the cutting chain when the engine is running. 18. Do not operate a chainsaw that is damaged, improperly adjusted or not completely assembled. Be sure that the cutting chain stops moving when the throttle control trigger is released. If you are in doubt regarding the mechanical condition of your saw, consult your servicing dealer. 19. Follow the manufacturer's sharpening and maintenance instructions for the chainsaw. Sharpening cutting chain requires two steps: sharpening of the cutting edge and adjustment of the depth gauge setting. When in doubt, see your servicing dealer for advice or repairs. 20. Use only replacement bars and cutting chains specified by the manufacturer, or the equivalent. Guide bars and cutting chains affect not only performance, but kickback safety as well. 21. Maintain proper saw chain tension. A loose chain can come off the guide bar and can strike the operator. 22. All chainsaw service other than the items mentioned in the owner's maintenance instructions should be performed by competent chainsaw service personnel. Improperly performed maintenance may damage the saw and present a hazard to the operator. For example, if improper tools are used to remove the flywheel or if an improper tool is used to hold the flywheel in order to remove the clutch, structural damage to the flywheel could occur and could subsequently cause the flywheel to break. 23. Use caution when handling fuel. Move the chainsaw at least 10 feet away from the fueling point before starting the engine. Do not smoke while refueling your saw. Use gasoline powered chainsaws only in well ventilated areas.